The official website of Swindon Concert Band! Born in Swindon, Malcolm studied flute with Wilfred Smith (Principal Flute, Covent Garden Orchestra) and has a busy and varied schedule both playing and conducting. 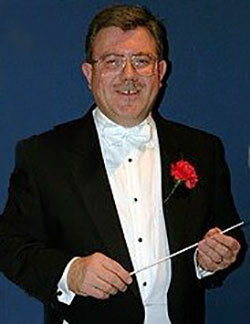 Malcolm began conducting shortly after joining the Wiltshire Police Band when, having deputised for the Band’s MD on several occasions, he was invited to take up the role of Musical Director, and enjoyed a successful period of 14 years conducting the band. During this time, he also started conducting musical theatre and quickly established a reputation for the quality of his productions. This culminated in him being invited to become Musical director to SALOS with whom he has worked for nine years, conducting their annual musical production at the Wyvern Theatre, Swindon. Malcolm also had a successful association with Swindon Opera for 10 years conducting numerous operas in Swindon, Cirencester and Cheltenham. Malcolm is currently conductor of the Swindon Symphony Orchestra and his concert programming is characterised by introducing unfamiliar works, some by famous composers, alongside mainstream orchestral repertoire. Malcolm tries hard not to neglect his own playing; he is Principal Flute with the British Police Symphony Orchestra, with whom he regularly tours the UK, playing in some of the country’s most prestigious venues, and with whom he has performed as a soloist. He also plays with the North Wiltshire Orchestra, which regularly performs in Chippenham and with whom he has performed concertos by Mozart and Ibert. As a flautist, his appointment as Musical Director to Swindon Concert Band brings Malcolm back to his roots and he looks forward to exciting times working with the band.